Temptation of Christ, Bearer of the Law of the Gospel is a fresco by the Italian Renaissance painter Sandro Botticelli, executed in 1480-1482 and located in the Sistine Chapel, Rome. 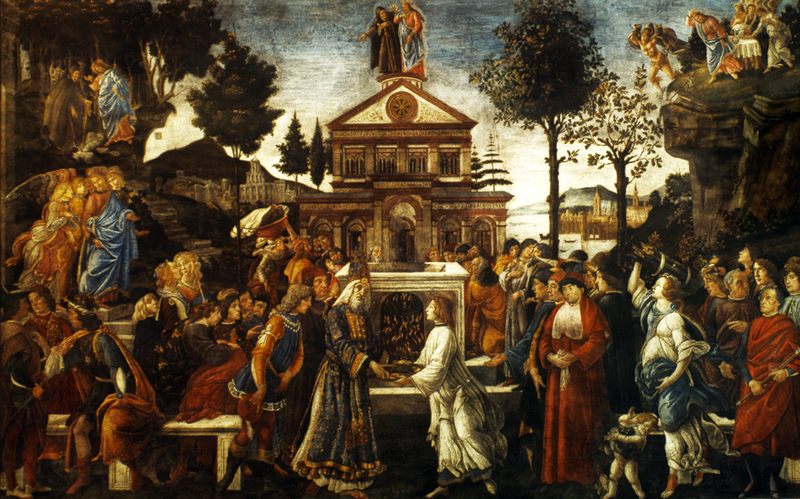 This is one of three frescoes that were executed by Botticelli and his workshop as part of the same project. The theme of the frescoes was a parallel between the Stories of Moses and those of Christ, as a sign of continuity between the Old and the New Testament. A continuity also between the divine law of the Tables and the message of Jesus, who, in turn, chose Peter (the first alleged bishop of Rome) as his successor: this would finally result into a legitimation of the latter's successors, the popes of Rome. 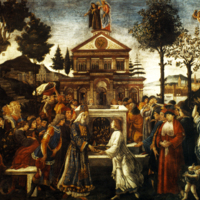 The scene of the Temptations of Christ depicts three episodes from the gospels, in parallel with the scene on the opposite wall, also by Botticelli, showing the Trials of Moses. The painting has a frieze with the inscription (similar to the other fresco's) saying TEMPTATIO IESU CHRISTI LATORIS EVANGELICAE LEGIS ("The Temptations of Christ, Bringer of the Evangelic Law"). Sandro Botticelli (Italian painter, ca. 1444-1510), “Temptation of Christ, Bearer of the Law of the Gospel,” Institute Images Online, accessed April 24, 2019, http://westerncivart.com/items/show/2764.